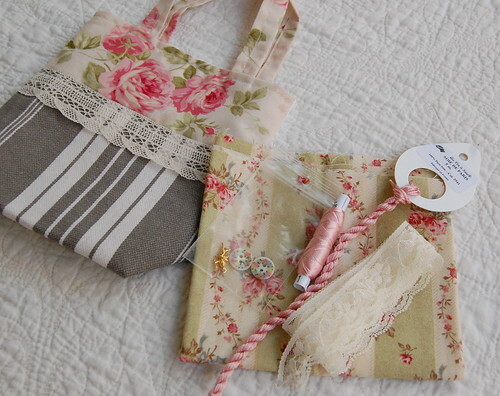 Nicole's Needlework: Surprises in the Mail! Isn't it all just gorgeous?? I couldn't believe she sent me all of this. It was so generous of her to send the chart alone, but to also send everything else... well, I was just speechless! 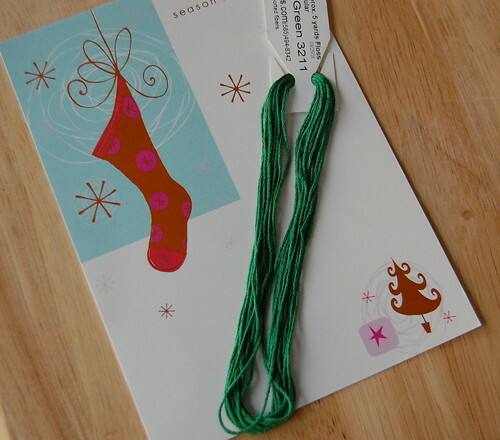 I also got a very sweet card and a beautiful skein of silk thread from Michele. It was so thoughtful of her! I haven't been stitching too much since I've been home. I have been too busy cleaning my mess (I left the house a disaster - all my last minute stitching, sewing, trying to finish and frame, etc). I did get "Family Sampler" out again and put a few stitches in that. 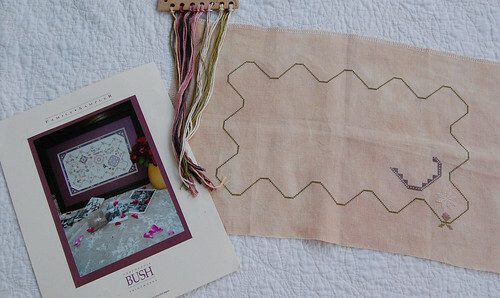 Melissa's stitching inspired me to get back to mine! I love the little bag you rec'd from Alexandra. How nice to arrive home to find goodies waiting for you! And I'm glad you were inspired to start Family Sampler because, guess what, the first time I saw it ages ago, it was on your blog! Then I wondered where it went! ;-) What goes around does come around! That's a beautiful bag, Nicole, and the goodies inside look lovely, too! I hope you get back into the swing of things at home soon. Welcome back! 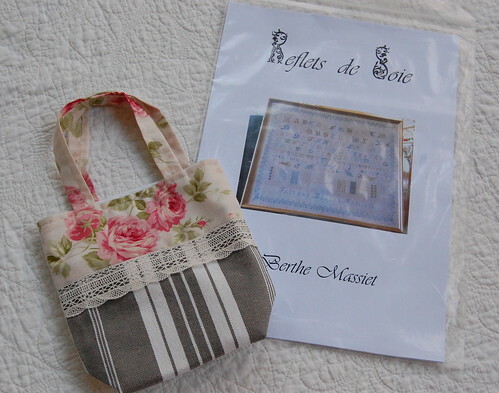 Sweet little bag with such lovely contents, what a great gift. Family Sampler is a very nice project. Enjoy. Gorgeous gifts, Nicole. That little bag from Alexandra is darling. Look forward to your progress on FS. It's great to get inspired by other people's blogs. You inspire a lot of people too!